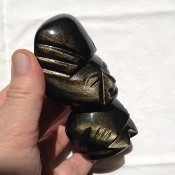 GOLDEN-SHEEN BLACK OBSIDIAN - Clears out sticky denser energy from your energy field, releasing negative thoughts, emotions, gossip energy, cutting cords of vampiric energy from others. Grounding energy, absorbs negativity from you, removes fear, shock and traumas. It also clears and protects you from harsh or negative energies/people surrounding you and your environment. When having a tough day at work or around arguments, clear item daily under running cold water, for about 2 min's, with intention of removing any unwanted dense energies. The golden-sheen has chatoyancy (a cat's eye quality), is like a million eyes that act like a vaccume, sucking in negative energy surrounding your energetic fields.Approximate size: 4" x 1.75" x 1.75"